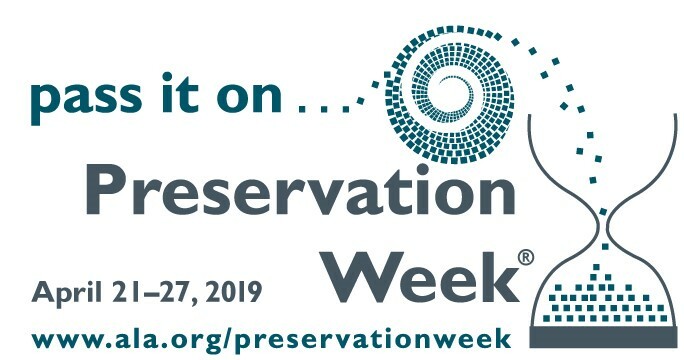 The Preservation Department at UVA Library invites you to celebrate Preservation Week 2019 with us. Tuesday April 23rd 10:30-12 Mount Vernon Room: Boxmaking for your Personal Treasures with Nicole Royal. Because of the size of the room, there will be a limit of 8-10, so please RSVP to Nicole at nir4x@virginia.edu . Note: This event is for UVA library staff only. Wednesday April 24th 12-1 Byrd Morris Room: Brown Bag Lunch with Preservation folks to talk about some projects we’ve been working on. Note: This event is open to the public. Have a preservation-related question? Feel free to submit at lib-pre@virginia.edu and we will answer it during preservation week! 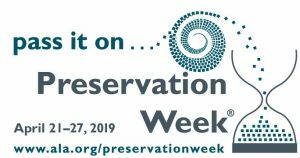 Since 2012, the preservation community has supported Preservation Week as a way to highlight what we can do, individually and together, to preserve our personal and shared collections. This entry was posted in Preservation, Upcoming Events by Kara M. McClurken. Bookmark the permalink.